A whimsical leaf pattern provides the border on this medal to frame the 2" insert of your choosing. Rings at both the top and bottom of the medal add versatility in appearance according to where the ribbon is attached. Personalize the back of the medal to commemorate your event, or reward accomplishment. 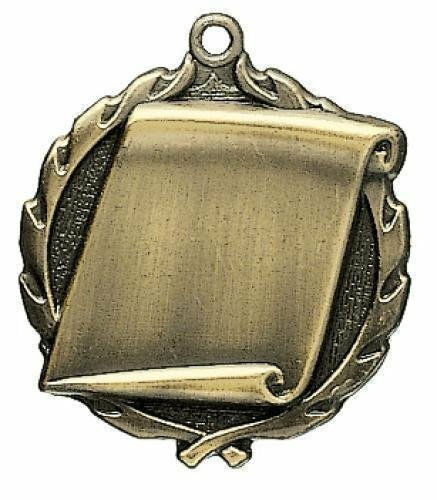 A budget friendly award, the medal is available in antique gold, antique silver and antique bronze. These 2 3/4" antique gold insert medals are perfect for any occasion. Ideal for collegiate ceremonies, sports tournaments, banquets, employee recognition, these awards are bound to impress! Recipients will be honored to receive these stunning gold medals at your upcoming event. Make sure to invest in yours today. Available in bright gold, silver or bronze. These 2 3/4" antique gold insert medals are perfect for any occasion. Ideal for collegiate ceremonies, sports tournaments, banquets, employee recognition, these awards are bound to impress! Recipients will be honored to receive these stunning gold medals at your upcoming event. Make sure to invest in yours today. Available in antique gold, silver or bronze.